We’d love your help. 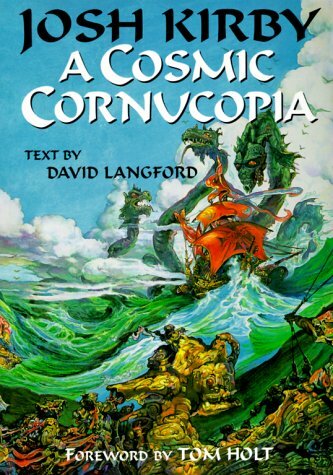 Let us know what’s wrong with this preview of Josh Kirby A Cosmic Cornucopia by David Langford. Josh Kirby's exuberant cover paintings for Terry Pratchett's bestselling Discworld series have spawned dozens of imitators, but no one has yet matched his irrepressible and chaotic humor. As this definitive collection of Kirby's art--including many formerly unpublished works--proves, his vision has many facets. They go from the wildest fantasies to the hardest sci-fi; some Josh Kirby's exuberant cover paintings for Terry Pratchett's bestselling Discworld series have spawned dozens of imitators, but no one has yet matched his irrepressible and chaotic humor. As this definitive collection of Kirby's art--including many formerly unpublished works--proves, his vision has many facets. They go from the wildest fantasies to the hardest sci-fi; some images evoke a macabre realm of horror, others portray chilling futuristic landscapes, but all are wondrous. An analysis of Kirby's career and techniques will increase your appreciation of each picture: the Discworld delights, bursting with detail and action; the ghoulish depictions of things that go bump in the night; and the representations of the science fiction worlds inspired by Ray Bradbury and Robert Silverberg. Plus: enjoy a comic compendium of interpretations from the pens of authors such as Tom Holt. A visual feast not to be missed, with an informative text by multiple Hugo Award-winner David Langford. 112 pages (all in color), 8 1/4 x 11 3/4. To ask other readers questions about Josh Kirby A Cosmic Cornucopia, please sign up. British science-fiction author, editor and critic. He publishes the newsletter Ansible.